It’s that time of year, when delectable delights of culinary cuisine take center stage. Food is such an important part of every culture and tradition—and also our fondest memories. That’s why we asked three people who cook all day, every day, to share what the holidays—and home cooking—mean to them. Nick Pitillo, owner of Osteria 166, Mercato and Villaggio, was raised in the restaurant business and has always been surrounded by family. This has been a driving force for everything he does, including how he celebrates the holidays. “My father passed away before I hit my teens. He loved everything about Christmas, and made a big deal out of Christmas Eve. We had cathedral ceilings in our home, so of course we trudged through the Ellicottville snow every year to find the perfect 30-foot tree that we would all decorate on Christmas Eve. Afterwards, the adults enjoyed pasta fagioli, hot peppers and homemade sausages. The kids, namely myself, got ginger ale and pepperoni pizza,” he said. “My family is very Italian. We do a roast, seafood like king crab legs, mom’s famous raviolis, and desserts such as cannoli chips and sfinge (an Italian take on donuts). This one time, no one could find me—until someone checked under one of the tablecloths, and there I was with powdered sugar all over my face,” he said. At Osteria 166, it’s a family affair: Owner Nick Pitillo’s mother and aunt make herb raviolis, a Pitillo holiday staple, for the restaurant to serve fresh every Thursday. 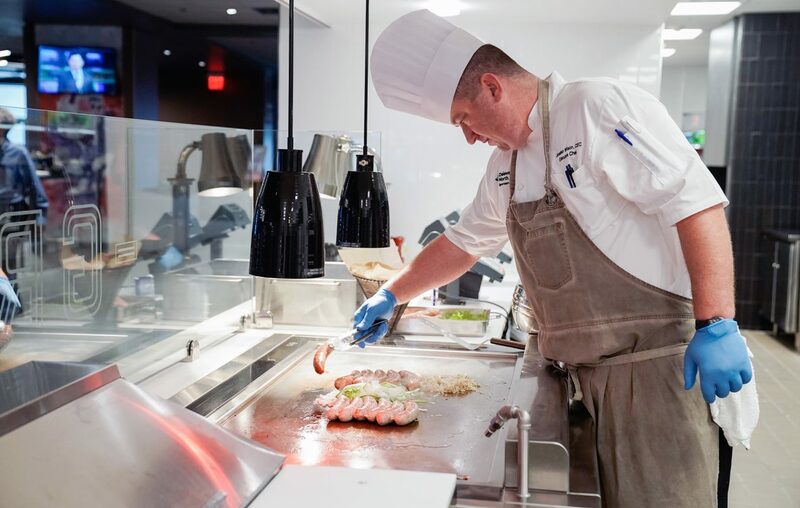 When it comes to the holidays, Executive Chef Oliver Wolf of Seneca Resort and Casino restaurants combines the old with the new. One of Wolfe’s traditions includes making breakfast for his family on Christmas Eve morning. The rest of the day is then spent prepping for that night’s festive dinner. Oliver Wolf, executive chef at Seneca Resort and Casino, whips up a special Christmas Eve breakfast for his family, along with dinners on Christmas Eve and Christmas Day. Growing up, Wolfe says German traditions always included wiener schnitzel (a thinly breaded, pan-fried veal or pork cutlet), goose in orange sauce, braised red cabbage and lots of festive cookies like vanilla crescents and Springerle. “In Germany, we start celebrating the season at the beginning of Advent (the start of December). It’s important for me to hold on to some of those traditions. I light the Advent wreath on Sundays with my family; we listen to music and play games. I also serve Glühwein (hot spiced mulled wine) during the season—for the adults. It’s punch for the kids,” he said. At the Seneca Resort restaurants, Wolfe serves mainly traditional American foods, like turkey, ham and fresh pumpkin pies. “I really enjoy cooking and planning our holiday menus. It’s important that the guests have a truly festive and great meal,” he said. Jonathan Wilson, executive chef for Delaware North Sports Service at New Era Field, has a unique perspective when it comes to coordinating his holidays. Since most Christmas Eves are home games for the Bills, Wilson spends much of his time with the players. “Working for the Buffalo Bills makes the holidays a busy time for me. We make breakfast for the team, hand out family to-go meals and then I make sure I have my staff out the door by 1 p.m. so they are able to celebrate with their families,” said Wilson. Family to-go meals are for coaches, Bills players and their families, since most of them have moved here from out of town. “We make full meals for the guys, and they are filled with all the trimmings—turkey, glazed ham, short ribs or salmon, mashed potatoes, stuffing, sweet potato or pecan pie, and cookies or cheesecakes. We want it to feel like home and prepare it just the way they like it,” he said. Christmas morning is special to Wilson, when he spends time with his daughter opening gifts and cooking a festive meal. “If I have venison in the freezer that’s my go-to. I love anything venison. I also make stew or chili. I like to keep it simple—maybe a red wine marinade, fresh herbs and garlic or shallots for my seasonings. Sides usually include root-parsnips, rutabaga, carrots or squash. And I absolutely have to have roasted beets,” said Wilson. Working for the Buffalo Bills can make planning the holidays a challenge, but Wilson says he spends as much time with family as he can.